Iam trying to load sql metadata into Essbase using parent/child. 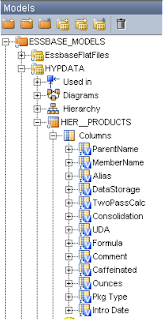 The interface is executing succesfully but the problem is hierarchy is not getting created in the essbase outline and the metadata is loaded in a single line like normal data. where can I find the file for me to make the change so that I can use Tab as the delimiter. I met the same "tab" issue as you mentioned. But where can I get the source code of odi? 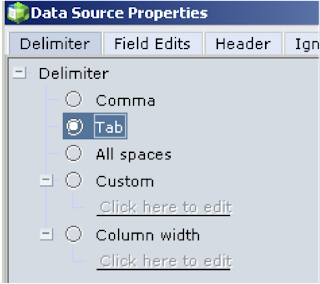 It seems I have to use tab in the rule since the source is oracle and there are some fields contains ","
Thank you for taking the time to share your knowledge with us. I am currently referencing your page a lot to learn more about ODI as we are looking for a way to integrate and automatically update Essbase from our ERP (Oracle EBS). Thus I am following your blog and redo all these steps up to the Load Essbase Meta Data post. I saw you did it through both file and SQL upload to Essbase. However, can you point me to the right direction if there is a way to load meta data and data straight from Oracle database to Essbase instead of having to (I assume) go from Oracle to SQL and then to Essbase using the IKM SQL to Essbase?